Indoor Outdoor Rugs – Transforming your home into a place that is inviting, cozy, and warm doesn’t have to be that difficult to pull off when you know how to accessorize your space. One of the cheapest and easiest ways for you to make any part of your home look better is to install indoor outdoor rugs. Indoor outdoor rugs are rugs that can give you the look and feel of an indoor stylish floor covering with the durability that is typically found in an outdoor area rug. These rugs come in a variety of sizes, styles, and designs that afford you a variety of options. What’s great about indoor-outdoor rugs is that they can withstand spills, splashes, and heavy foot traffic with minimal damage. These rugs look well in the dining room, kitchen, screened porch, and even in the bedroom. These days indoor-outdoor rugs are an accepted part of indoor decor if you are looking for a stylish interior decoration that can improve the overall look of your home. What else should you know about this type of rug? It is typically made from polypropylene synthetic fibers. This allows them to withstand stains, moisture and even fading. They need minimal maintenance and can be vacuumed, shaken, or spot-clean to remove any dirt, dust, and stains. Some rugs can even be washed down with a garden hose. Simply wash to give it a good cleaning. Then drape on a fence or a few chairs to allow it to air dry. 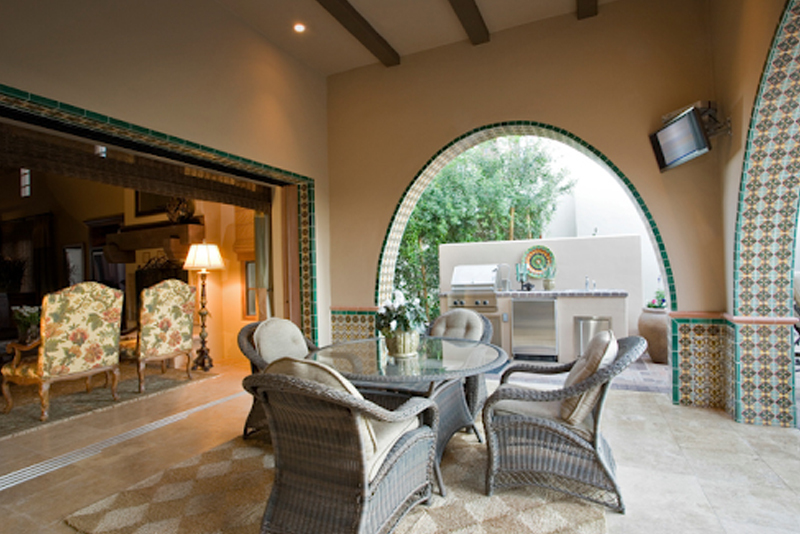 One of the benefits of investing in indoor outdoor rugs is that they can add just the right pop of color to the home. Just imagine the variety of designs, styles, and patterns from which to choose. Whether you want to brighten your space or darken some part to create a focal point, rugs are perfect accessories to make your room aesthetically pleasing to your eyes. 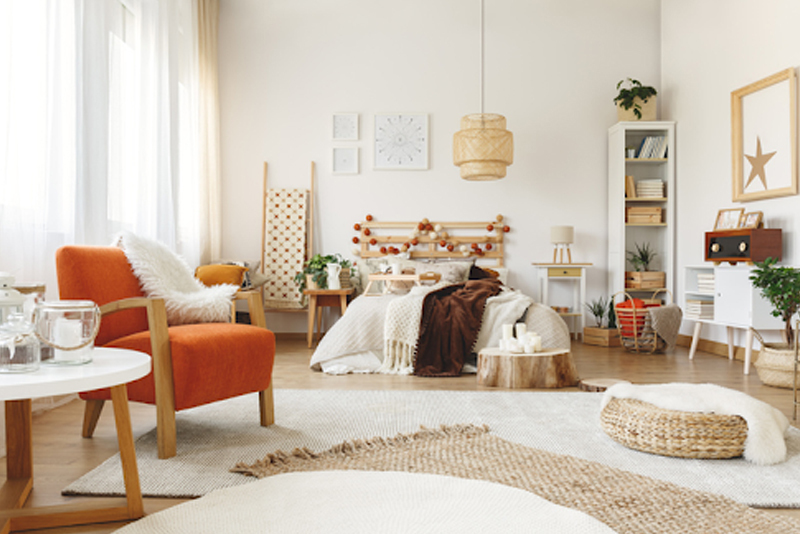 Another plus to adding rugs is that they can help define a space in your home. For example, placing a rug under your dining table anchors your dining set in one specific area. You can incorporate it into your living room if you want to create a focal point or create a delineation among the furniture pieces. To create a small reading nook, place a couple of comfortable chairs and a small table. Define the area with a small rug. Wooden floors may be the highlight in your home, but high traffic area can leave them looking worn out quickly. Adding indoor-outdoor rugs, on the other hand, provide adequate protection to the surface of your wooden floors so that, even with kids or pets running around, there will be fewer scratches and scuff marks on the floor. Another benefit that you are sure to enjoy when investing in a rug is that it is easier to clean compared to carpet. Regular vacuuming, spot cleaning, and washing can help keep your rug looking great. Plus, you can bring them out to your outdoor patio for easy cleaning. What other benefits can you get from indoor-outdoor rugs? They help keep your feet warm during the cold, winter months because of the materials because of their materials. There are a few things that you need to consider when you plan on purchasing indoor/outdoor rugs. Here are some factors that you need to take into account. There are different types of materials used for area rugs such as human-made or synthetic. Some withstand constant exposure to the elements better than others when placed in an outdoor space. You’ll find some that are made from recycled plastic, so you can easily wash it as needed. On the other hand, natural rugs too that are made from cotton, sisal, wool, or jute require special care. Natural fiber rugs are known for enhancing a room’s beauty and even create texture. Textures such as cotton and wool tend to feel soft under your feet. However, the natural fibers can get damaged when they are constantly exposed to moisture, so and are at risk of forming mold and mildew. Aside from the specific materials, you will need to take into consideration the size of the rug or mat that you are going to get. Go for a shape that will complement the style of your furniture. For example, a round rug is recommended for a 4 seater dining set, while an oval or rectangular rug is ideal for rectangular shaped patio dining sets. The rug should be at least large enough to put all the furniture on it. Indoor outdoor rugs come in a variety of hues and designs. That makes them easy to mix and match them with the rest of the furniture pieces regardless if they are indoor or outdoor. Once you determine where you want to place your rug (dining room vs entry hallway) and the emotion you want to evoke, you can figure out the color and pattern. Maintenance should be a factor when shopping for indoor outdoor rugs as you need to perform proper maintenance. The good news is that, depending on the materials, you will learn what cleaning method is appropriate for them. For example, polyester, wool, and other natural materials will require specific cleaning processes to prevent them from fading or getting damaged. Always check the tag attached to the rug and don’t hesitate to contact the manufacturer if you still have questions. There is no doubt that indoor/outdoor rugs can add beauty to your space, but how will you be able to use them to fulfill their potential? Here are a few ideas that you can use to create a more inviting space for you both indoors and outdoors. Handmade from recycled plastic bottles, this rug has an earthy tone to it that will look great on both the living room or bedroom, especially if you want to add pops of color to your space. Easy maintenance is a benefit of this rug as it doesn’t shed and can withstand constant foot traffic as well. If you are looking for an indoor/outdoor rug that can withstand constant foot traffic, this geometric pattern rug is perfect as it is made from polypropylene for easy cleaning. You can use in your outdoor area, on your porch, or even in your living room. The combination of blue and ivory stripes create a soothing atmosphere that encourages you to relax. It can withstand the wear and tear of running pets and children. Maintenance is easy. Whether you are planning on using this rug indoors or in your outdoor area, the combination of beige and white is going to blend nicely with your choice of furniture. This rug would also look good in an outdoor area such as a wooden porch or screened-in porch. The colors go well with the outside and the rug feels good underfoot. Spills clean up quickly. If you are working with a minimalist or modern themed indoors, where white is the main color, you can break the monotony with this black and white rectangular indoor-outdoor rug. The thick bands draw the eyes, making the rug a great focal point not just in terms of outdoor patio rugs, but also for indoor use. While it is stain resistant, will still require cleaning from time to time. For those who are feeling nostalgic when it comes to floor design, this vintage vinyl floor cloth is a nice option to consider. This will look great in baths and kitchens. Depending on the decor, you can incorporate it into your home office or in your screened porch as well. This indoor-outdoor rug is made from polyester fiber made from recycled plastic bottles and is even UV-treated to prevent fading. You’ll find that its texture is similar to that of wool which is lightweight and soft. It is a reversible type of rug that you can wash and scrub with ease. This is the perfect rug to use for both indoors and outdoors, specifically in areas where there is plenty of traffic as its chunky weaves can withstand the constant wear and tear. If you are looking for a rug that has texture and pattern, this Moroccan inspired rug comes with stripes, knots, and even a Boho flair that feels good underfoot. The fibers are quite soft and washable too, so you won’t have a hard time cleaning your rug as needed. This will look great indoors, specifically your living room, where it can blend nicely with wooden or even modern furniture pieces. This is a classic piece that combines pale pink, sky blue, citrus green, and taupe in a rug that can be used both indoors and outdoors. Pastel shades look great on white flooring or light wooden floors as they can add pops of colors. 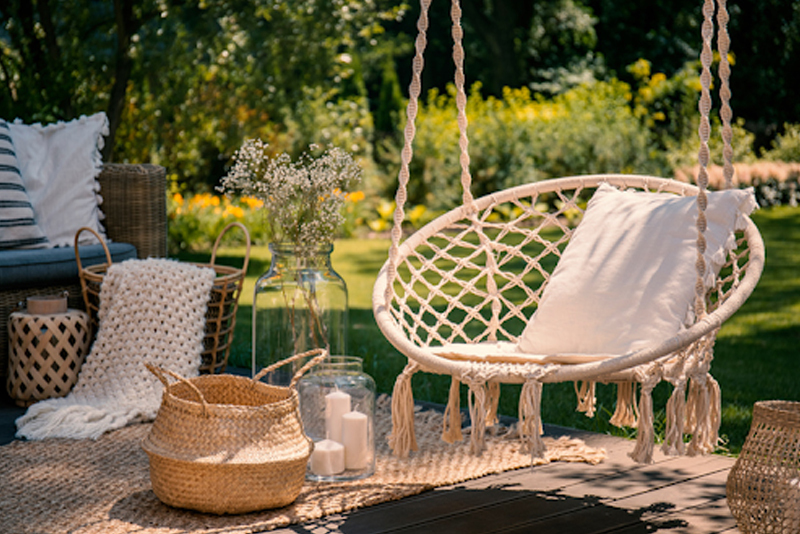 You can complement the look with a wooden chair, or wicker chairs when outdoors. Consider bringing it in your kitchen where it can add some comfort to your feet as you move around, preparing your meals. Indoor/outdoor rugs like this are certainly an eye-catching piece to have in your home with its geometric pattern and bright red color. It is durable and made to withstand spills and stains. You can leave it outdoors without worrying about fading, plus it is reversible, bleachable, and scrubbable too. There is no doubt that indoor-outdoor rugs are useful when it comes to decorating your home because they are durable, sturdy, and capable of withstanding the constant foot traffic. What’s more, these rugs are easy to maintain, unlike carpets where you will need professional help to remove the stains or revive its natural look. These types of rugs can withstand the elements as they are designed to be protected from the UV rays which means that you can leave it on your patio or porch without worrying about fading. These are relatively cheaper compared to installing wall-to-wall carpets, but they can also be used to accessorize your mats, carpets, or other rugs as well.